Browse all current news releases and use the tabs to find news from past years. Want to receive up-to-date news and information ? Sign-up to receive emails or texts on a variety of subjects by subscribing to our e-newsletters. Grass fire burns approximately 100 acres. Stolen vehicle recovered, two suspects arrested, third suspect still at large. Unattended Death in the 4500 Block of Starboard Court. Structure Fire in the 200 block of Evans St. Lyons, Co.
December 1, 2016 Phone services for CenturyLink customers in Allenspark impacted911 calls are being rerouted to Fire Department - CenturyLink phone services in Allenspark have been impactedllenspark Fire Department, where we have a Boulder County Sheriff's Office reserve deputy there to answer them. CenturyLink technicians are working to restore service as soon as possible. August 11, 2016 Following his sentencing for sexual assaultThe Boulder County Sheriff's Office is releasing Austin James Wilkerson's mug shot via a media advisory, due to the number of requests received for the photo. All other case inquiries should be sent to the Boulder Police Department. Additional Cold Springs Fire neighborhoods to open permanently to residents today at 3 p.m.
July 9, 2016 Fire start at Peak to Peak Highway north of Nederland - Fire is currently at 100 acres, no containment. Mandatory evacuation orderDDITIONAL UPDATES WILL BE MADE ON THE BOULDER COUNTY OFFICE OF EMERGENCY MANAGEMENT WEBSITE, FACEBOOK, AND TWITTER ACCOUNTS. Update on the death investigation at the Boulder County Jail. 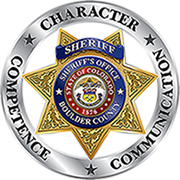 February 5, 2016 - At 8:15 a.m. Boulder County Communications received a phone call about shots heard in the 4400 block of Broadwayo remain inside their homes until further notice. We will release more information as soon as it is available.